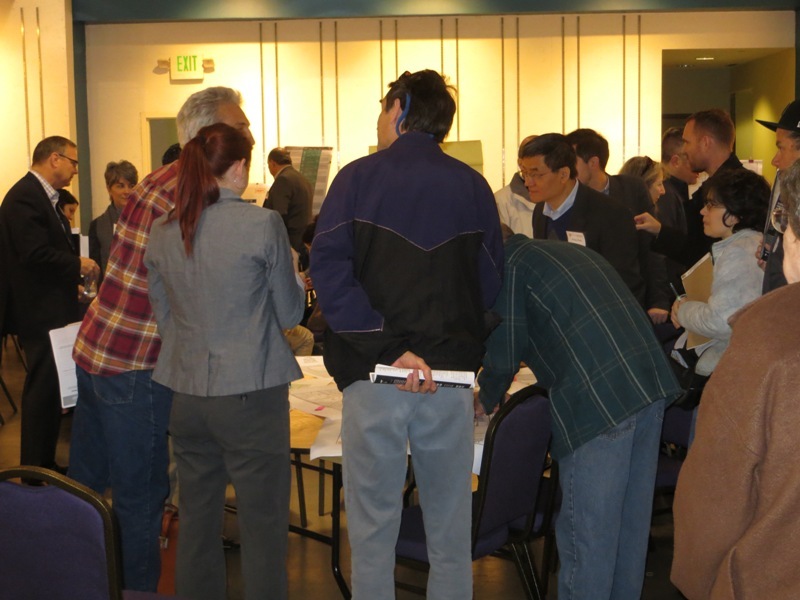 Structured around issue-oriented tables, Project Connect’s Feb. 8th “interactive workshop” finally managed to get dozens of community participants engaged in lively discussion. Project Connect’s Feb. 8th “interactive open house-workshop” event was interesting both in the information to be learned (discussed in another posting) and in the way it was structured — at last, an opportunity in an event, open and publicized to the public, for community participants to actually raise questions and discuss issues in a small-group community environment. In that sense, it can be regarded as at least a minuscule gesture toward actually democratic community engagement. One can only imagine how the outcome might have been different — in terms of the process of selecting routes — if even this very minimal kind of “interactive workshop” event, rather than the art-gallery-style “open houses” and highly managed shut-up-and-click-on-the-choices-we give-you “clicker workshops”, had been deployed in the “Phase 1” process of this “high-capacity transit study” process. 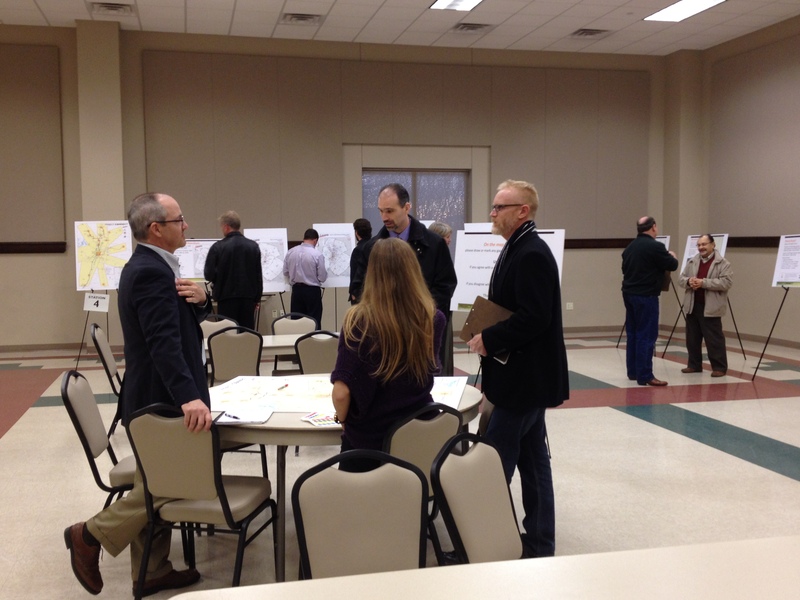 With at least dozens of people in attendance, the event was structured mainly around small-group tables discussing various issues, such as mode and alignment, for the proposed “high-capacity transit” services along routes selected in “Phase 1”. At these tables, questions could, at last, be asked in a group setting. This facilitated a more earnest discussion of issues, and allowed community members to interact more effectively with one another — learning things, encountering different viewpoints, exchanging new perspectives and information. This, however, is a very long way from what’s needed for a fully democratic process with effective community oversight (along the lines of the precedence of years ago). Instead of seeking validation and acquiesence from poorly informed and misled participants, an authentic community involvement process would have one or more ongoing, widely accessible oversight committees, meeting with Project Connect staff and receiving reports — somewhat like the so-called CCAG (“Central Corridor Advisory Group”) or TWG (“Transit Working Group”), but with some members well-seasoned in the issues and armed with expertise to enable them to ask the really crucial and trenchant questions, and raise far more critical issues. General community meetings would dispense with Project Connect’s “lecture-and-clicker” approach, and allow short presentations by staff followed by open public questions and comments at an open mike. These would be supplemented by true workshops and charettes (for which the Feb. 8th event gave a small taste of how this could work). But don’t hold your breath — Project Connect’s leadership all along has seemed to have a firm idea of what it wants this process to propose, and doesn’t appear to be prepared to allow community input to divert it from its course. As democratic involvement and real meetings have disappeared, public participation at Project Connect’s events, such as this “open house”, has withered. Photo: Project Connect. This posting has been excerpted, adapted, and expanded from a personal Email sent by the author to someone involved with Austin’s urban rail study, in response to an inquiry. The lack of bona fide democratic discussion and participation by the public has been seen by many in the Austin community as an ongoing problem with Project Connect’s “community outreach” and “public participation” procedures. However, the current problem merely continues and intensifies a policy tendency, over approximately the last dozen or so years, among some local Austin-area public bodies — particularly involved with transportation and urban planning issues — to discourage and suppress authentic community involvement in planning such proposed projects and services. This stands in stark contrast to the vibrant, lively public involvement of the 1970s through early 2000s, where popular input was encouraged and solicited in the form of participatory community meetings and personal involvement of a widely representative array of individuals in actual planning committees. Finding a suitable model for implementing true democratic discussion today in Project Connect and other programs would be simple — reinstating the types of outreach, public participation programs, and community discussion activities that were typical of Austin-area transportation planning up until the early 2000s. These types of participatory processes have gradually been attenuated in recent years. A fully democratic and effective process of community participation and discussion is essential, particularly so that community participants feel they have true involvement, engagement, and a stake in the planning process. At least as important, critical planning issues are effectively scrutinized and analyzed, and additional professional expertise (in architecture, engineering, planning, finance, etc.) in the community is accessed and brought to bear on various aspects of the project. Almost certainly, the lack of such oversight and engagement of community expertise has been a major factor in the array of serious methdological and data problems that have characterized Project Connect’s urban rail study process and impugned its credibility. See, for example, the wide range of problems and community discontent documentted in this blog’s recent posting TILT! Project Connect’s gerrymandering and data fiddling ignite public skepticism, pushback. Ongoing citizen advisory committees used to be (and should be now) much larger, with multiple members typically appointed by each councilmember, Capital Metro board member, etc. In the late 1980s, Capital Metro’s Citizens’ Advisory Committee involved over a hundred members, with at least several dozen typically attending a given meeting. Professionals with transit-industry expertise and community activists on transportation issues were often appointed to these bodies, rather than specifically excluded, as they are now. My longtime friend and professional colleague Dave Dobbs and I served on several such committees through the development of the regional transportation plan by the Austin Transportation Study (precursor to CAMPO) and the creation of Capital Metro (we both served on the Austin-Travis County Mass Transportation Commission that recommended creation of a regional transit authority for the Austin metro area). Another particularly important example of our community participation involvement was the advisory committee to the Transitway Corridor Analysis Project (TCAP), in the late 1980s. 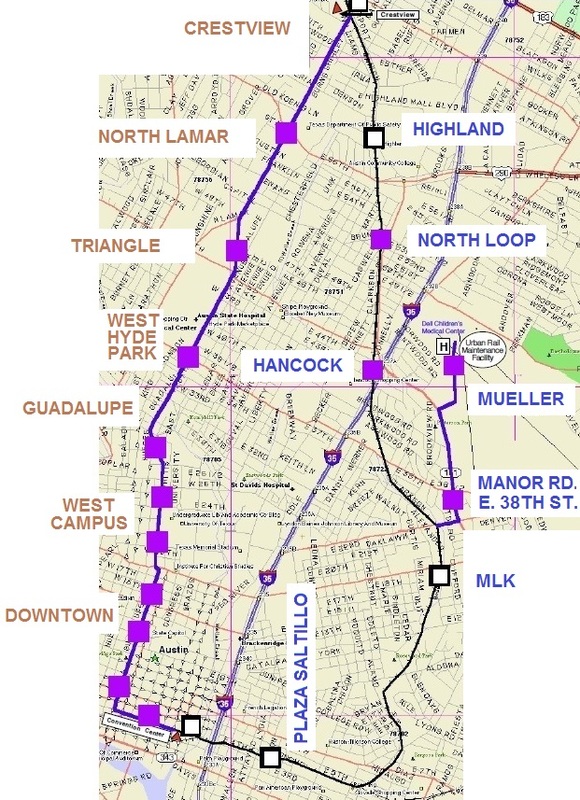 The TCAP committee had at least several dozen members, including interested stakeholders like Alan Kaplan and Roger Baker, and met regularly with the Capital Metro personnel and consultants directly involved with evaluating either a busway or light rail transit (LRT) for a fixed transit line from the core area to the northwest, possibly using U.S. 183, the railway alignment, I-35, or a combination of these alignments. The democratic involvement of highly interested and technically savvy community members was critical to the final outcome of the TCAP study. Dave and I and other committee members questioned or challenged assumptions and methodology point by point, in a democratically interactive process that altered the course of the study. 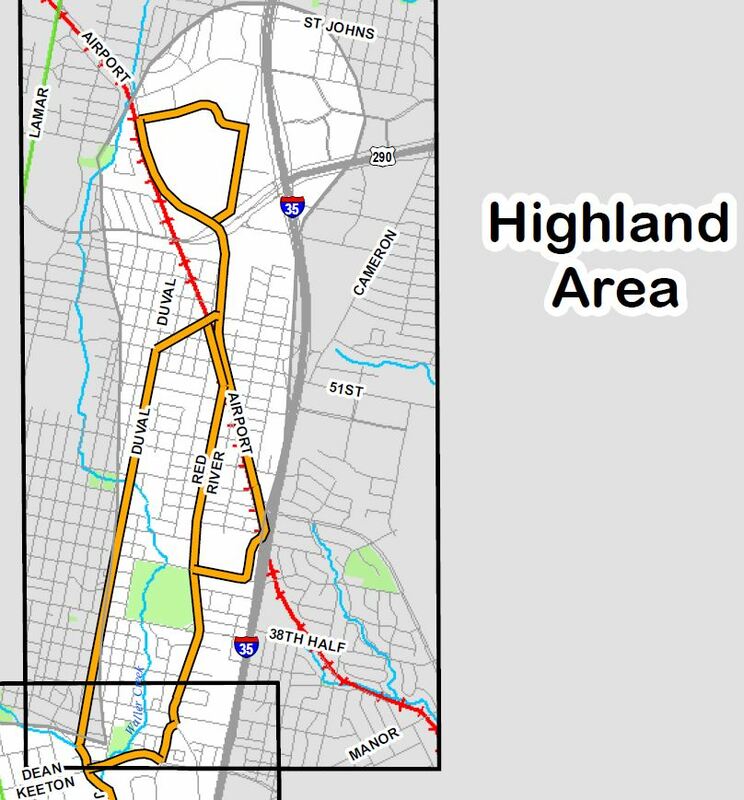 The original intent had seemed to be to justify a busway in this corridor, and if this had prevailed, buses would probably be rolling along through Crestview, Wooten, and other neighborhoods on a paveway in the Capital Metro railway right-of-way today instead of MetroRail DMU railcars. But instead, the advisory committee and consultants ultimately recommended LRT, and this was selected by the board as the Locally Preferred Alternative. There has been nothing comparable to this kind of democratic community interactive planning within roughly the past decade. Community meetings have likewise virtually disappeared. I recall open, fully democratic meetings, with large attendance, in various areas of the Capital Metro service area when I was on the authority’s board during the original LRT study in the early 1990s. Board members like me, and top officials like General Manager (CEO) Tony Kouneski, would attend these meetings. Participants weren’t just given clickers to respond to the contrived choices presented by Capital Metro — they were free to voice their opinions, ask questions, even respond to other views expressed in the meetings. New views, new options, could be voiced. The community members learned things from one another and felt a far greater sense of involvement in the process that is totally missing today. 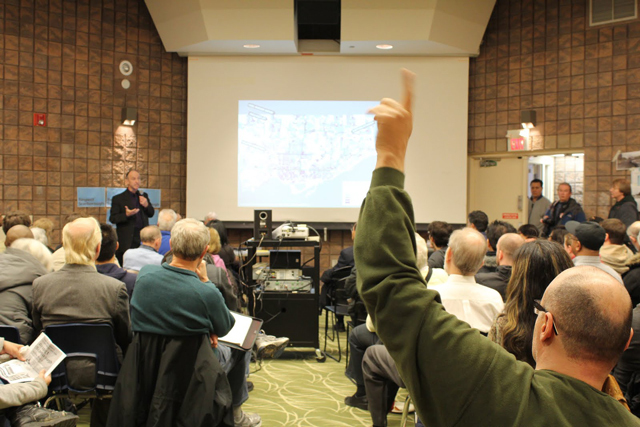 Real community meetings, such as this one focused on transit options in Toronto, allow free and open discussion and facilitate questions and comments from the attendees. In contrast, Project Connect’s events have squelched community discussion and sought to manage and muzzle discussion. Photo: Torontoist. During the LRT study process in 1999-2000, numerous small community meetings were held all over the city to explain the LRT plan and alternatives, and receive real input, freely voiced, from the community. Then-General Manager Karen Rae herself typically led these meetings, usually accompanied by one or more staff personnel. This interaction helped fine-tune the eventual alignment that was proposed. Even after the LRT referendum narrowly failed, in 2001-2003 democratic public meetings continued, involving both smaller meetings around the city and larger public meetings, including charettes. Attendees had the opportunity to speak, voicing comments or criticism and asking questions, at all meetings. Workshops in past periods previously were far different and more democratic than the recent ones sponsored by Project Connect. The groups, often subdivided by particular topics, would discuss an issue for perhaps 20-40 minutes. A participant was also free to visit other groups at other tables and inject comments, suggestions, etc. Each table group (“workshop”) would select one member to summarize the group’s conclusions, or controversial issues, to the entire meeting in a summation period. Individual group members had a chance to clarify points covered in the discussion. In contrast, Project Connect’s recent “workshops” seemed more like mechanisms to contain and squelch discussion rather than facilitate it. Discussion was confined to each individual small group, for perhaps 5-10 minutes at most. Only very narrow topics — basically, “choices” presented by Project Connect — were presented for discussion within each table group … with no real opportunity for alternatives and questions to be presented. Project Connect staff members, present at each table, then filtered and briefly summarized some of the discussion to the larger group. In contrast to the Transit Working Group (TWG) meetings, which at least allowed a few 3-minute “citizen communications” at the end of each meeting, Project Connect abolished even such minimal community input at meetings of its successor, the Central Corridor Advisory Committee (CCAG), until the last one before Project Connect made its decision on urban rail sectors. In other words, CCAG could not formally be presented with alternative views, ideas, and proposals, or criticism of the official methodology, throughout the critical period when decisions were being made and ratified by CCAG. In sum, Project Connect’s overall “public involvement” exercises have seemed more like a gesture at public involvement as a CYA effort to fulfill federal requirements. • A general advisory group that is large and inclusive, with representatives appointed by all councilmembers, Capital Metro board members, and possibly other public bodies — rather than a small group hand-picked by the mayor. This advisory committee would also be able to co-opt additional members to itself. It would provide a forum to consider both official proposals and alternative proposals and ideas from the community, while seeking a consensus with the official project team. • Numerous smaller meetings (covering several sectors with several neighborhood areas per sector) at least every couple of months, where participants could voice their alternative ideas, concerns, questions, criticisms, and other comments to the meeting group — thus sharing and disseminating alternative views and approaches within the general community as well as among project staff. • At least a couple of charettes, open to the public at large, over the course of the project. These would focus on key issues particularly needing public input. The emphasis would be on the voicing of ideas and assessments, not just clicking choices among prescribing alternatives. • Major public meetings, every 3-4 months, in a “hearing” format, where community members could at least have a chance to voice their views. In contrast with this kind of open process from past times, the new model of “public involvement” by public agencies, exemplified by Project Connect’s process, seems designed mainly to muzzle the public, procure some kind of very shallow public acquiescence for official decisions, and thus allow project officials to claim validation. It also ensures that officials can proceed with planning effectively isolated and insulated from democratic community scrutiny and input — thus (as I’ve characterized it) operating “inside a bell jar”. Neighborhood groups and other community organizations need to make it clear they’ve had enough of this sham pretense at “public participation”. They need to demand a reinstatement of at least the level of democratic participation that was the norm in the past. In ARN’s previous blog entry, Back to “art galleries”! Project Connect reneges on community meetings, we noted that “In a sudden reversal — and what appears to be a breach of trust and a breach of a de facto agreement with many in the Austin community”, Project Connect (the current ongoing rail planning consortium) had abruptly changed its forthcoming Urban Rail Central Corridor public involvement events from meetings into so-called “Open Houses”. Meetings are fundamental to truly democratic process. They allow for community interactive input, i.e. community discussion along with the project personnel. They bring members of the entire community together, allow them to hear ideas and views from one another, allow them to interact on the public record (or at least with public witnesses) with officials present, force official representatives to deal with and respond to difficult questions and issues, and allow officials and participants to get a sense of community attitudes expressed in a community manner. One person’s question or comment may give ideas or motivation to other participants. It should be noted that Project Connect is also deploying other means of communication with the public, in addition to “open house” events — a webinar was held this past Friday, and project staff are also considering workshop-style small-group activities. Plus the team are outreaching through individual meetings with various community groups. Project Connect, the City of Austin, Capital Metro, and other public agencies have a crucial responsibility to facilitate these kinds of cross-community, cross-demographic, cross-organizational, fully diverse, fully democratic public meetings. So far, they seem to be trying to avoid them like the flu. Austin Rail Now will continue to support efforts to reinstate the truly democratic public meeting process as Project Connect moves forward with its planning activities. … Project Connect has scheduled some upcoming meetings (and a “webinar”) between Sep. 4th and Oct. 2nd (details below) that seem to offer a bona fide opportunity for the public to meet in a community fashion, both discussing the issues and interacting with one another. Unfortunately, the prospect of bona fide public meetings “for the public to meet in a community fashion, both discussing the issues and interacting with one another” no longer seems valid. 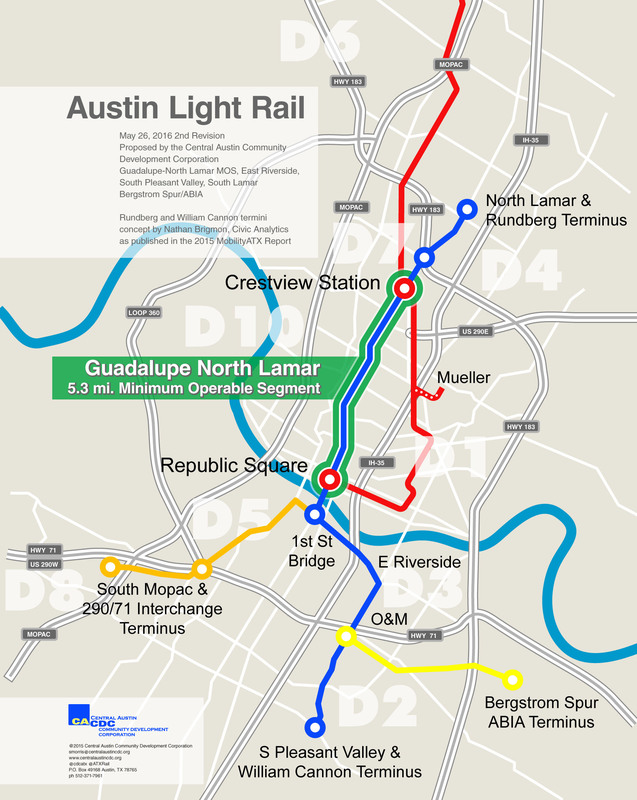 In a sudden reversal — and what appears to be a breach of trust and a breach of a de facto agreement with many in the Austin community — Project Connect has abruptly stopped describing the forthcoming Urban Rail Central Corridor public involvement events as meetings, and instead is now promoting them as so-called “Open Houses”. It is labeled as an Open House because that connotes that people are free to show up at any time, unlike a public meeting or workshop, which usually has a set agenda and starting time, thus limiting full participation to those who are able to show up at the start of the meeting. These meetings will be more of a hybrid open house/workshop. Participants can come at whatever time they choose and be able to see exhibits and speak directly to agency staff to have their questions answered, and formal input will be gathered through questionnaires and encouraging participants to draw and make comments on sub-corridor maps. This is a crucial point, and one that many community activists involved with the urban rail planning process thought had been settled — in favor of community meetings. This community interactivity is lost in the individual, one-on-one format of “Open Houses”, which have no set agenda, no community public speaking, and involve agency personnel displaying graphics of their pre-determined plans and chatting individually with the occasional community members that might attend the event. Transportation consultant Lyndon Henry (an Austin Rail Now contributor) has compared these events to wandering through an art gallery, with the chance to chat individually with the gallery guards (agency personnel). There’s no opportunity for real interactive community involvement. The major problem I see is that while Open Houses usually have lots of big impressive maps, these meetings commonly tend to evolve toward little unstructured conversation clusters, with an official at their center, near a map, and with others standing around, trying to hear, waiting to ask their own questions. Every citizen can come in and ask the same question as those who came earlier, and these exchanges are essentially rambling private discussions that tend to go on and on without clearly answering certain important policy questions. Usually there is no record of the questions asked, nor the responses given. These events tend to become a succession of unrecorded one to one exchanges. Meetings provide a time and place for face-to-face contact and two-way communication-dynamic components of public involvement that help break down barriers between people and the agencies that serve them. Through meetings, people learn that an agency is not a faceless, uncaring bureaucracy and that the individuals in charge are real people. Meetings give agencies a chance to respond directly to comments and dispel rumors or misinformation. Far from being passive gatherings, meetings are interactive occasions when people discuss issues of consequence to them and their neighbors, listen to opposing viewpoints on the issues, and work together for the common good. Agency staff people who handle public meetings need to be trained in skills that encourage interaction and also keep the process focused and productive. An open house is an informal setting in which people get information about a plan or project. It has no set, formal agenda. Unlike a meeting, no formal discussions and presentations take place, and there are no audience seats. Instead, people get information informally from exhibits and staff and are encouraged to give opinions, comments, and preferences to staff either orally or in writing. Is the planning and decisionmaking process really that important to the kind of plan that emerges? You bet it is. Vigorous, authentic community involvement is absolutely critical, particularly in injecting new ideas and perspectives, raising special concerns, scrutinizing and evaluating official approaches and decisions, safeguarding the project from the influence of special interests and extraneous political issues, and generally keeping the official planners and decisionmakers “honest”. Furthermore, voters are far more inclined to support ballot measures for major rail projects if they have a sense of ownership through opportunities for bona fide participation in the process. Project Connect’s seemingly abrupt decision to downgrade the format of these public events from meetings to “art galleries” (“open houses”) suggests more of a desire to minimize, or squelch, rather than maximize, public involvement and dialogue in the urban rail planning process. This would also appear corroborated by Project Connect’s rather puzzling lack of publicity for these public events. The consistent and steady pattern by local public agencies (particularly involved in public transportation issues) of degrading the bona fide democratic public participation process over the past period has been alarming, and I did speak out about this when I worked at Capital Metro. Individual chats between individual community members and official personnel do not represent a democratic process of community participation, and I’ve personally seen the level of such participation decline significantly over the past couple of decades. It’s very troubling to see this same policy now being carried forward and rationalized despite assurances made otherwise. 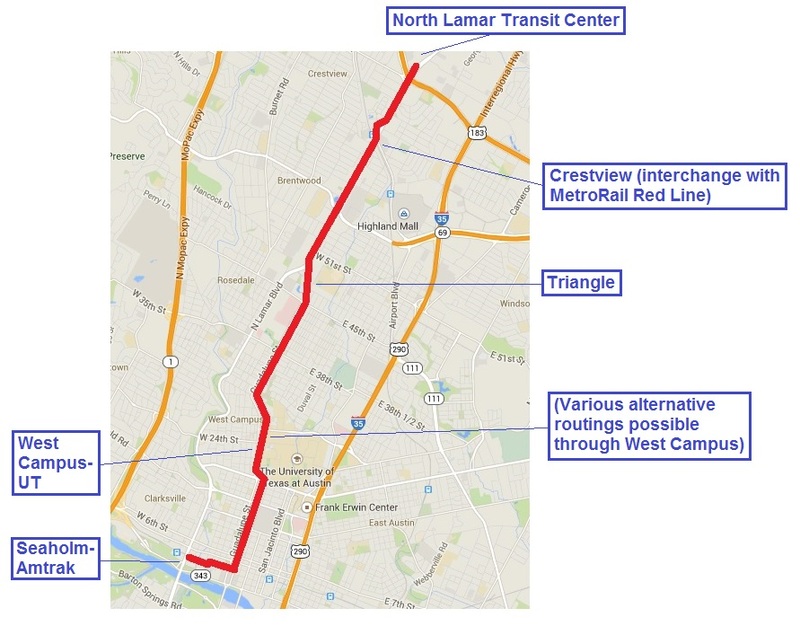 Despite these efforts by Project Connect to discourage public participation, Austin Rail Now continues to urge supporters of a Phase 1 urban rail starter line in the Guadalupe-Lamar corridor to attend these events and vigorously express their views.